Favorite Quote: He had gone beyond the world of metaphor and simile, into the place that things are, and it was changing him. Neverwhere's protagonist, Richard Mayhew, learns the hard way that no good deed goes unpunished. He ceases to exist in the ordinary world of London Above, and joins a quest through the dark and dangerous London Below, a shadow city of lost and forgotten people, places, and times. His companions are Door, who is trying to find out who hired the assassins who murdered her family and why; the Marquis of Carabas, a trickster who trades services for very big favors; and Hunter, a mysterious lady who guards bodies and hunts only the biggest game. London Below is a wonderfully realized shadow world, and the story plunges through it like an express passing local stations, with plenty of action and a satisfying conclusion. 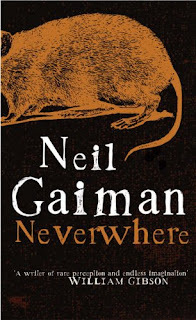 The story is reminiscent of Douglas Adams's The Hitchhiker's Guide to the Galaxy, but Neil Gaiman's humor is much darker and his images sometimes truly horrific. Puns and allusions to everything from Paradise Lost to The Wonderful Wizard of Oz abound, but you can enjoy the book without getting all of them. Well, I admit I didn't get very many allusions to Paradise Lost. But I did love this book! I always think that I don't enjoy fantasy set in the modern-day, that it just doesn't do anything for me the way that historical fantasy does. And then I read a Neil Gaiman book and start drooling. Honestly, the man has got skill. What a marvelous writer. I didn't know that Neverwhere was a tv series in the UK as well. I am not sure if I should watch the miniseries now, after having read the book. The book was so great that I feel certain the tv version would be a letdown. But maybe not. Seriously, though, I need to get my hands on more Neil Gaiman. I don't know if I can really say why I liked this book so much. Sometimes, it's really just a matter of the right book at the right time. Maybe this was one of those instances. But for some reason, the characters really resonated with me, and the writing seemed so lyrical as to almost be set to music at times. I could have chosen from so many very descriptive quotes to showcase above- I just chose one. I loved the way Gaiman wrote this book with a nod to London's history, showing how so many places and things that are now just names- they all resonate with a past that deserves acknowledgement and respect. Where do those Underground stops get their names? Gaiman knows, and tells us. It's remarkable how many important historic events and ideas and places get distilled down through the ages until all the deep meaning is almost completely forgotten. And it's amazing that Gaiman considered that angle to be novel-worthy, and wrote such an incredible novel as this one about just such a situation. Ok, ok, and I admit to being more than a little in love with the Marquis de Carabas. As Richard Mayhew aptly describes, "the Marquis managed to make being pushed around in a wheelchair look a romantic and swashbuckling thing to do." Sigh. What a man ;-) I'll let you discover him for yourself. This book cries out for a sequel. And a prequel, really. I don't know if either of the two will ever exist, but here's hoping that there's a possibility. Until then, I'll just rest happily having this one read under my belt, and looking forward to discussion about it with all of you! If you haven't yet read his Sandman series, that's a must!! Oh, I love, love, LOVE this book! It was the first Neil Gaiman book I read, my favorite of his and one of my favorite books, period. There is a BBC production of it out there - not great but not bad for a low-budget version. I haven't read this book, but you make me think I have been missing something really special having not read it. I did read American Gods, and though I wasn't crazy about it I still thought it was very good. I am going to have to take a closer look at this book. It shouldn't be too hard since it's sitting on my unread shelf! This book was my first Neil Gaiman and I thoroughly enjoyed it. Great review! I wasn't completely in love with this book. I liked it but it happens that I read it to compare to China Mieville's Un Lun Dun which I *did* love and I think this one wasn't as rich and magical. I actually did a post comparing the two. I'm really glad you loved it too! This: "I loved the way Gaiman wrote this book with a nod to London's history, showing how so many places and things that are now just names- they all resonate with a past that deserves acknowledgement and respect" was probably my favourite thing about it.